5 Ways To Celebrate Earth Day This Friday! A recurring theme both at the Boonshoft Museum and our sister sites, SunWatch and Fort Ancient, is conservation. We conserve artifacts and specimens, and we teach children and families about our natural resources and how we can best preserve them. On Earth Day, we are all acutely aware of the impact that humanity has on our planet and its inhabitants, some big (like the Polar Bears at the Columbus Zoo) and some small (like Patience, the Boonshoft Museum’s Two-Toed Sloth). Two-Toed Sloths just like Patience face habitat loss due to deforestation of the South American rain forests. It’s easy to be intimidated by the effort requires to slow down the effects of deforestation, habitat loss, pollution, and climate change, but the Museum is committed to making sure that everyone, through small changes, has the ability to make a HUGE, positive impact on our environment–and what better way to kick-off a year of “green” living than by celebrating Earth Day on April 22! Get outside and bike to work! Actively Educate – By attending events like the Boonshoft Museum’s Earth Day Celebration and Super Science Saturday, your family will learn about our natural resources, like the Miami Valley Aquifer, in addition to how we can use science to conserve, preserve, and sustain our natural resources. Most of our special conservation days are included with regular admission or free to the public, so be sure to check our Calendar frequently for upcoming events! Be a Good Steward – One of the most critical challenges to the world today is climate change. 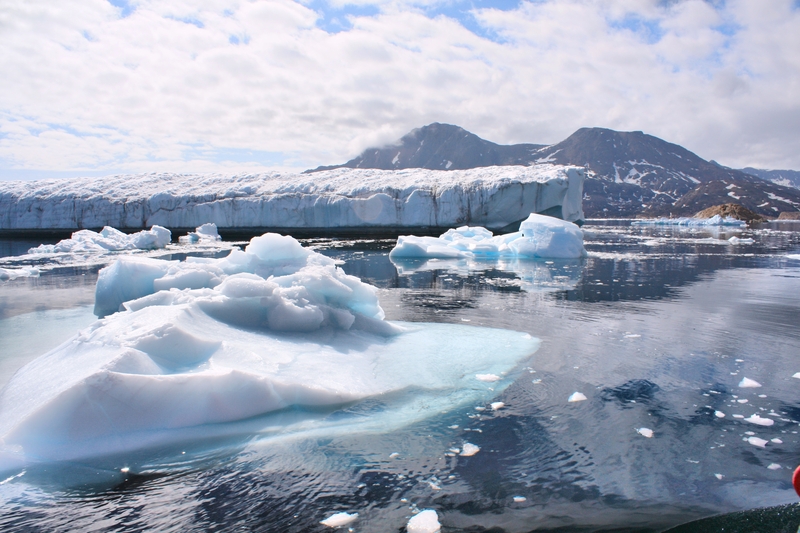 The change in climate affects the world’s ecosystems and has a ripple effect to which humans are not immune. Climate change affects our food sources and the economy. To be a good steward of the environment, try to save energy in your household. Simply turning the lights off when you leave a room, keeping your house a few degrees warmer during the summer, and unplugging electronics when you leave for school and work can collectively have a large impact on your energy usage and wallet! Purchase With a Purpose – You can shop smart and help fight deforestation by using sustainable alternatives to products that use Palm Oil and are created with recyclable materials. Palm oil is a key contributor to rain forest deforestation and can be found in common household items and food, like candy and cereal—even makeup. Opt into purchasing certified recycled products and support companies that use sustainable practices. Click here to view a list of companies that are dedicated to saving the environment. Plant for Pollinators – Between honey bees, bats, and butterflies, millions of dollars worth of crops and food are cultivated each year. With one in every three bites of food being indirectly or directly a result of honey bee pollination, something has to be done about their dwindling populations. Many of our pollinators are at risk due to habitat loss, so the best way to combat that is to create a pollinator-friendly place in your back yard! Monarch butterflies lay their eggs on milkweed, a flowering plant that can easily be planted in your back yard. You can also opt for a bat house or plant a bee friendly garden. Some honey bees are often confused with wasps, so if you have a nest that you wish to remove, ask a professional if it is a honey bee hive and if it is contact a local apiarist (beekeeper). 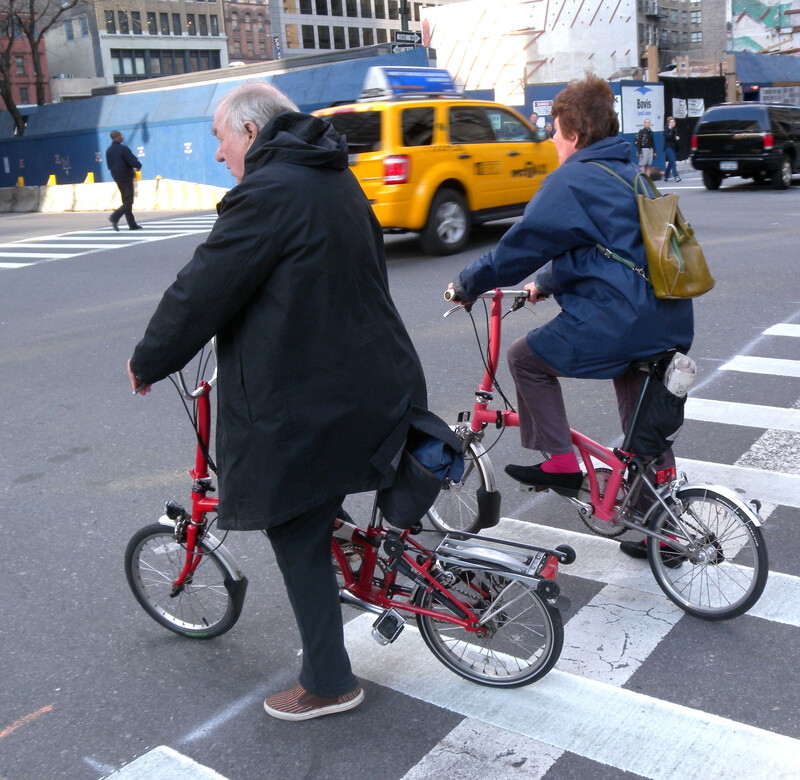 Get Active – If it’s a beautiful day and you need to run errands, consider riding a bike instead of taking your car. Not only does Dayton have some of the best bike trails regionally, biking to work is a green alternative to a car commute and it keeps you healthy! The burning of fossil fuels from motor vehicles creates both carbon dioxide and carbon monoxide, both of which affect our atmosphere and add to changes in climate. Just doing these 5 simple things can help save our environment and its inhabitants! Learn more tomorrow during our Earth Day Celebration! Happy Bat Appreciation Month: Why Pollinators Are Important! From tales of vampires to being some of the world’s most infamous “blood sucking” creatures of the night, many pollinators (like bats and honeybees) get a bad rap. 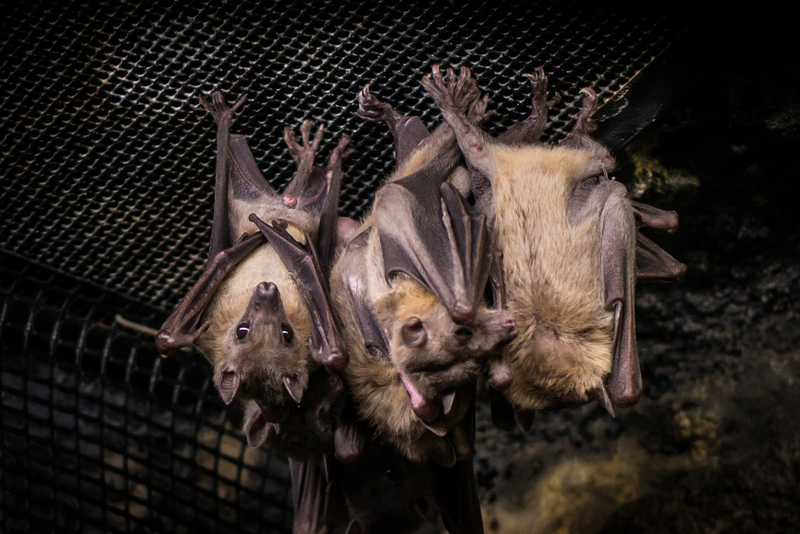 October 1 officially marks the beginning of Bat Appreciation Month—and we have some Discovery Zoo residents that want you to know a little more about how important they are! One of the Discovery Zoo’s Egyptian fruit bats. Aren’t they adorable? Bats are actually really helpful to ecosystems and humans! With more than 1,300 species of bats around the world, they all play a big role in terms of eating pesky agricultural pests, pollinating plants, and ensuring the growth of fruits and veggies that feed people across the world and support local economies. Bats may live in dark places, but that doesn’t make them blind. Actually, in some cases, bats can see better than humans. People get nervous when they see bats flying around because the notion that, if they are in fact, blind—they might bump into you by accident. False! Bats have incredible sensory abilities, including echolocation, which allows them to use sound waves to locate objects, kind of like sonar. While vampire bats do exists, they aren’t as scary as you think. Vampire bats weigh only two ounces, and average only three inches in length, meaning they are tiny. While it’s true that vampire bats have been known to bite people in Central and South America, they mostly feed on cattle. 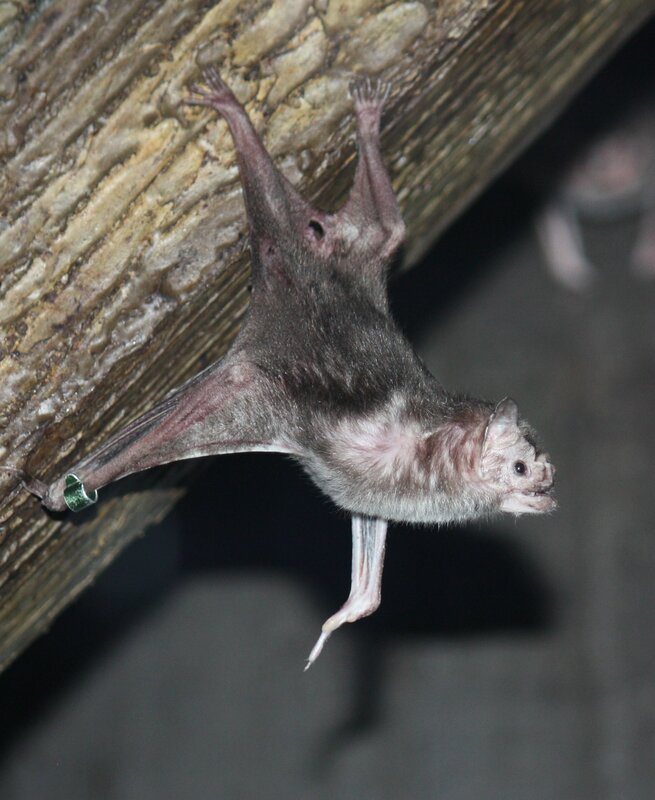 Imagine an overgrown mosquito—vampire bats are the same way! They only lick about a spoons worth of blood and can accomplish this task quickly because they have an anti-clotting enzyme in their blood, much like a leech. 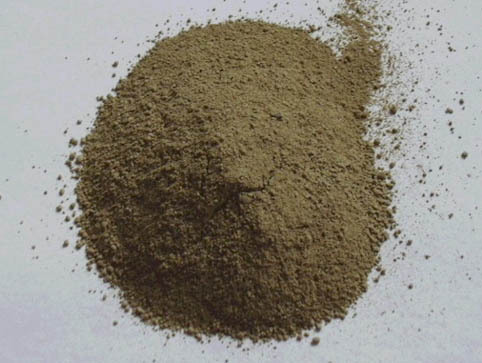 Bat poop, commonly referred to as “guano”, is a valued fertilizer. When collected responsibly (with no harm made to the bats or their environment), guano can be used by local landowners and communities to enrich their soil. This means better crops, which means more people are fed and local economies thrive. Bats are both seed dispersers and pollinators, making them integral to the ecosystems they inhabit and the economy. Bats around the world pollinate things from agave and bananas to cloves, carob, and peaches. Fruit-eating bats also disperse seeds to vital places, including cleared out rainforests—where regeneration of plants is vital. You can thank bats for things like avocado, dates, figs, cashews, and much more. 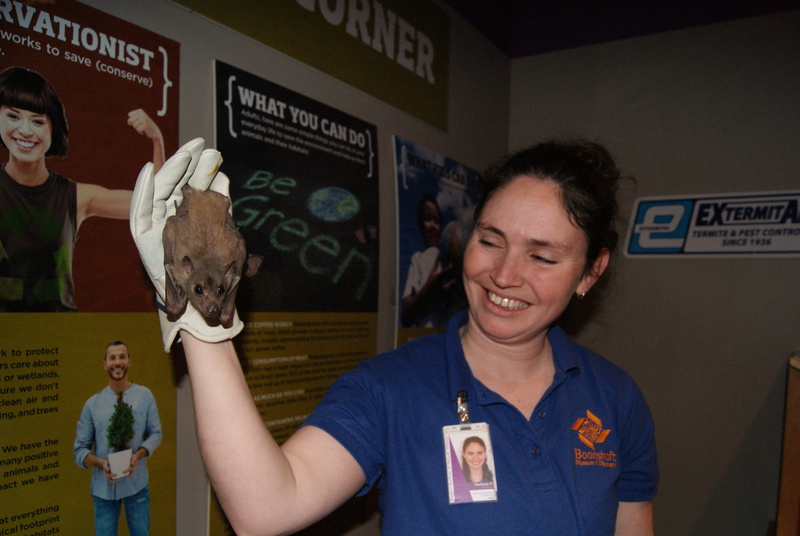 Keeper Melissa hanging out with one of our batty friends! As you can tell, the Museum is pretty serious about our pollinators, from our newest exhibit featuring live honeybees to our friends the Egyptian fruit bats. Each of these special creatures plays a vital role in the world and unfortunately, due to dangerous pesticides and climate changes, our pollinator populations are dwindling. So, next time you see a bee hive think twice about hurting its residents! After all, honeybees are directly responsible for one out of every three bits of food you eat! 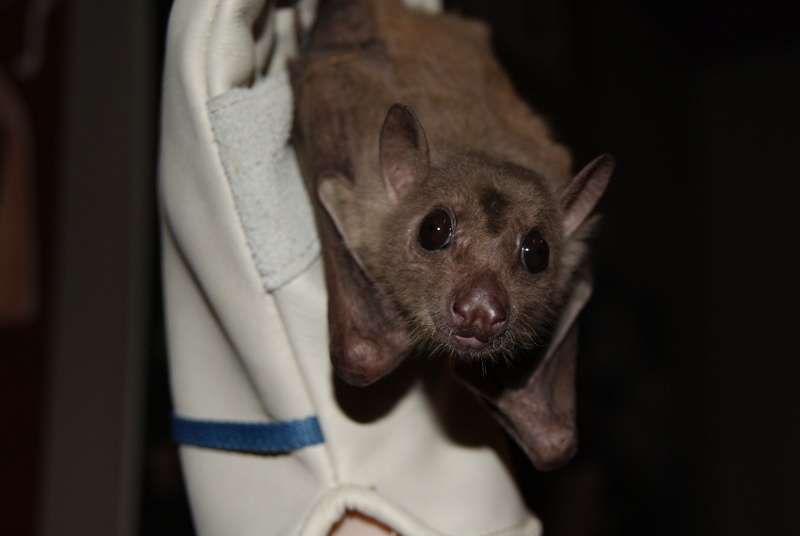 During the Halloween season when you see a “spooky” bat you can bust some bat myths and tell all your friends how important bats are to the ecosystem. The Boonshoft Museum’s Egyptian fruit bat enclosure inside the Discovery Zoo. The Museum’s newest pollinator friends, the honeybees, are on display as well. Be sure to visit our popular pollinators any day of the week in the Mead Westvaco Treehouse and the Discovery Zoo during normal hours of operation! Careers In Curiosity: Saving the World — One Animal (and Habitat) at a Time! 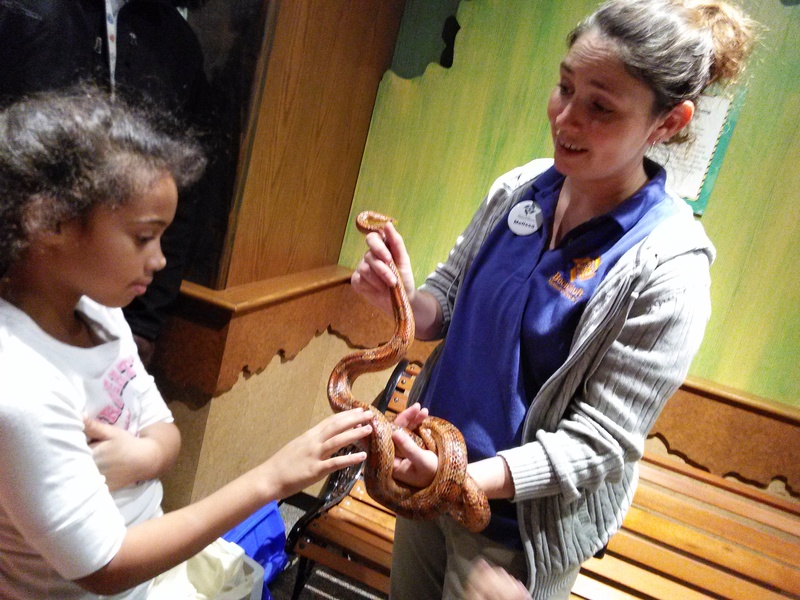 Melissa, the Museum’s Coordinator of Animal Training and Programming for the Discovery Zoo, offers children a chance to get hands on with our Education animals during Free Night. This week, we are continuing our exploration of curious careers! When you think about a typical Museum you may think of priceless art hanging on the walls, huge dinosaur skeletons, and display cases with artifacts that are thousands of years old. The difference between most Museums and the Boonshoft Museum is that we are also an accredited Zoo, with over 100 live animals – from mischievous Meerkats to Egyptian fruit bats. Having so many animals to care for requires a lot of time and effort, so we have a Live Animals Department that keeps our animals happy and healthy! Each of our Live Animals staff members have different educational backgrounds, from Natural Resources to Zoology and Biological Sciences—but they all have one thing in common, they love animals! Melissa Proffitt, the Coordinator of Animal Training and Programming for our Discovery Zoo, took a minute to blog about her awesome experiences with our Live Animals, the importance of conservation, and fills us in on how she ended up working with some of the cutest critters in the world! Read her guest blog below! Celebrating Earth Day With “Green” Family Fun! It’s no secret, every day is Earth Day here at the Boonshoft Museum. From learning about water conservation in Splash!, to becoming a recycling pro in our new Landfill exhibit, one of the biggest take-aways from a visit to the Boonshoft Museum is learning how every single person can make a difference when it comes to our Earth and the impact we have on it. Today, instead of just remembering to turn off the lights and take out the recycling (not that those aren’t wonderful, helpful things) make Earth Day a true celebration by participating in fun Earth-friendly activities with the whole family! 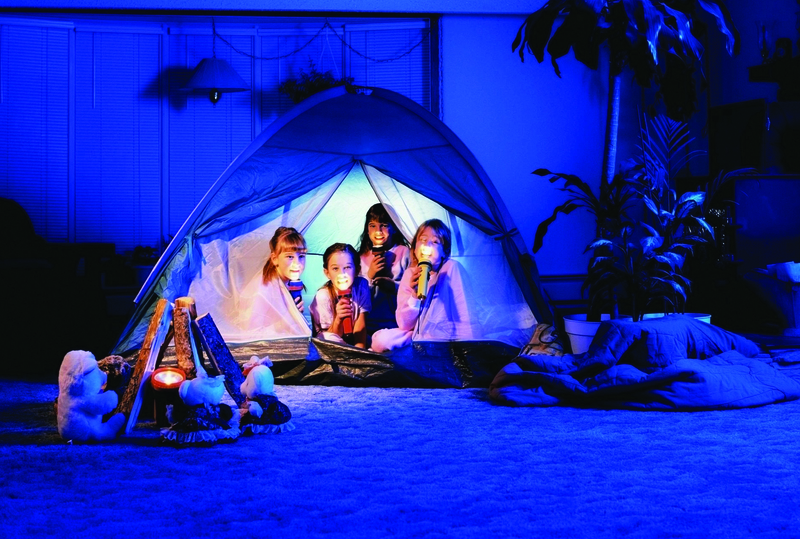 1) Camp In – Though it may not be quite warm enough to camp outside, there is a great alternative! Pitch a tent, grab a few sleeping bags, or build a pillow fort inside. Unplug your devices, turn the lights out and the flashlights on for some quality family time that saves energy. Simply turning your lights off and abstaining from electricity consumption for one hour can make a huge difference! In fact, during Earth Hour, a worldwide movement encouraging communities to turn of non-essential lights for one hour, places like Bangkok decreased energy usage by 73.34 megawatts – which is equivalent to 41.6 tonnes of carbon dioxide. Imagine if everyone “camped in” for just one evening a year, which would save an amazing amount of energy in addition to creating a ton of awesome memories! 2) Plant a buzz-worthy garden! Did you know that honey bees play a huge roll in pollinating the food you eat every single day? In fact, one out of every three bites of food that Americans eat is directly or indirectly derived from honeybee pollination, so why not help our flying friends out by proving a safe place for them to explore free of pesticides? Lavender, geraniums, and zinnias are beautiful, while fennel and cilantro can spice up your meals—and the best part? They can all be part of a bee-friendly garden that helps to conserve the honey bee population. 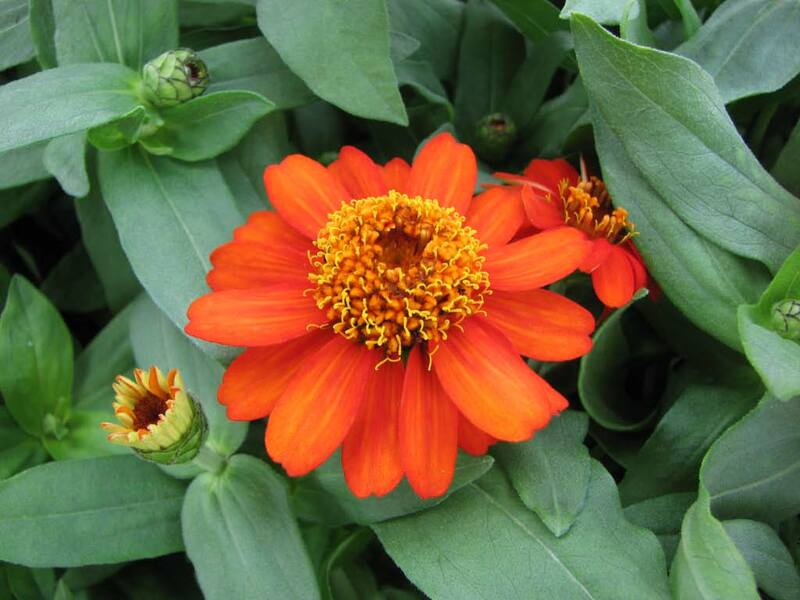 To learn more about planting a buzz-worthy garden click here. 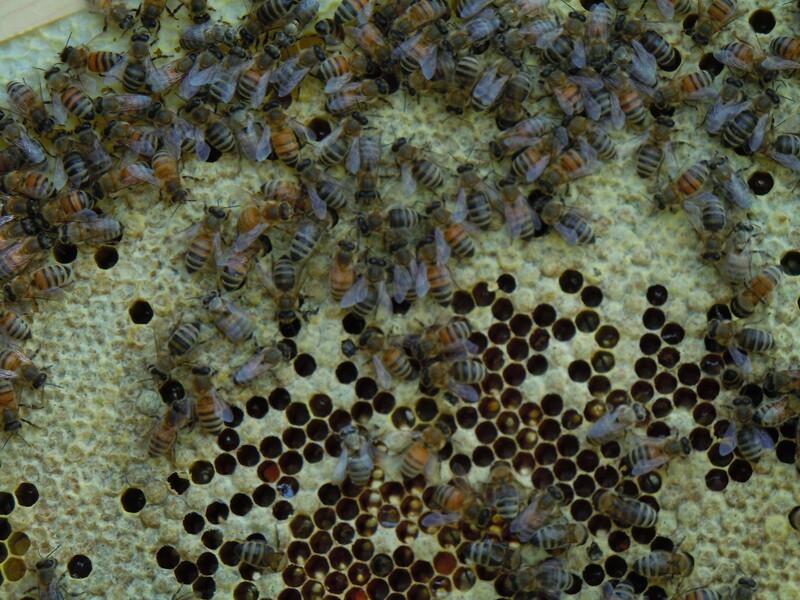 To test your honey bee knowledge, take the quiz linked below. 3) Trade in your Subaru for a Schwinn! Just for the day, see what it’s like to take a family outing to dinner, the movies, or to get ice cream. Not only do you treat yourself to some family time while getting some exercise (a 140 pound cyclist can burn up to 400 calories in an hour), you are making a greener choice by using a mode of transportation that does not require fossil fuels, therefore reducing your carbon footprint! Who knows! Maybe you will get the biking bug and participate in National Bike To Work Day on May 15. 4) Calculate your Carbon Footprint! Sit down with your family to see how you measure up to your national peers when it comes to energy consumption! The calculator, linked below, estimates your footprint in three areas: home energy, transportation, and waste. After you have taken the quiz, find small ways to adjust your footprint; hang the laundry out to dry instead of running the dryer, adjust your thermostat, and change your power settings on your computer to save energy and money. Not only can you see how much money and CO2 you will save by making these small adjustments, you can turn it into a family challenge with a goal that you can work towards. 5) Candid Chats About Climate Change! Climate change is not only real, it’s happening as we speak. The implications of a warmer Earth effect everything, from the smallest plants to the largest animals. Discussing climate change and the role that human beings play in it can not only help children understand the gravity of the situation, they can feel empowered to help—even at a young age. Hop on to nasa.gov to with your kiddos to play climate kids computer games; your child will not only learn about climate change, but what they can do to make big difference! For more ideas on how to become a conservation champ visit our Pinterest board, or stop by the Museum. Today, from 9:00 a.m. – 3:00 p.m. the Southwest Ohio EPA will be here sharing tons of wonderful Earth Day tips and providing interactive, hands-on opportunities for guests!